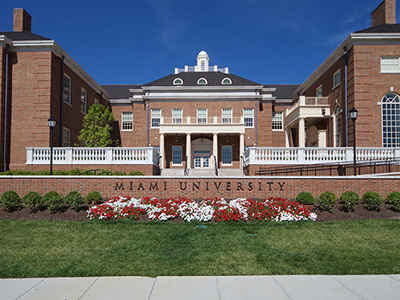 The IES partners with departments, centers, and physical facilities at Miami University on several initiatives, and conducts air and water quality monitoring in cooperation with Butler County and federal agencies. Students are involved in all of these activities, providing hands-on scientific, organizational, and cultural learning experiences. The academic programs of IES interface with initiatives to enhance campus sustainability through student research and service learning projects. See Sustainability at Miami. The Center for Aquatic and Watershed Sciences is a partnership between IES and the natural sciences to promote research, education, and outreach on freshwater issues at local, regional, and global scales. Stream Team monitors stream water quality throughout Butler County to identify pollution threats to streams and provide long-term data on water quality trends. The IES helps the Myaamia Center increase capacity of the Miami Nation of Oklahoma to manage its natural and cultural resources in a sustainable manner. Funded by the US Geological Survey, the IES monitors precipitation chemistry, dry deposition, and ozone at the Ecology Research Center, and is part of the National Atmospheric Deposition Program.